Originally Japanese Tea ceremony is performed on the Japanese Tatami floor. and in the chair-sitting way as well as other coffee or tea servings. Also it is just the lighting table in half-size, when not using for tea serving. 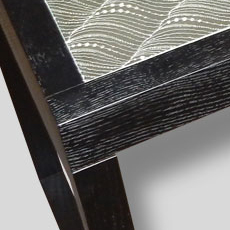 ”Ryurei Table”, the way of Japanese Green Tea　ceremony is to be served more easily and in the chair-sitting way. 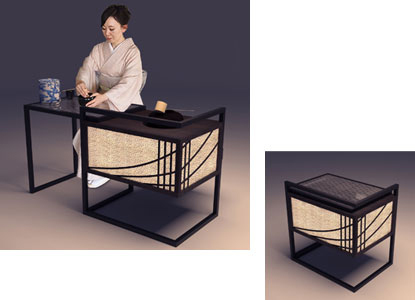 “Silk Art Tea Table” is more comfortable and suitable for people from overseas to enjoy Japanese hospitality and culture. Our product of Silk Shading diffuser of non-woven glass fiber sheet backing has the artistic effects with LED lighting device inside.We produce 4 seasons’patterns of delicately embroidered silk fabric. 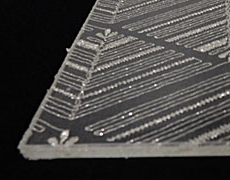 The table top of “Silk Glass” pattern would be better to be harmonized and coordinatd with the LED shading design. For perfoming Japanese tea ceremony, extending the top table and pulling-out of the lower board are usuful to perform the ceremony. 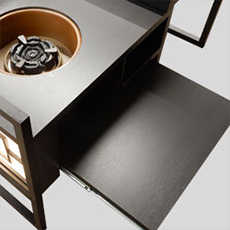 After tea serving, this table is in half size by folding the top , just for enjoying the LED lighting shade. When used as the tea ceremony “Ryurei table”, because there is a shelf on the back to pull-out, you can put there to “Kensui”. The heater made by NONODA is guaranteed, and in case of overseas using the electricity conversion will be acceptable. Electric heater for Japanese Tea ceremony can be installed with extra charge. 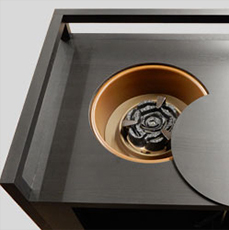 It is officially guranteed by Nonoda that is a establised maker of Tea Ceremony heater devices.